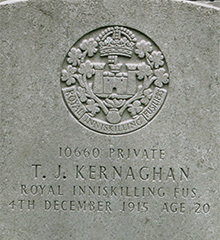 Thomas James Kernaghan was the oldest son of Thomas and Sarah Kernaghan of Augher. 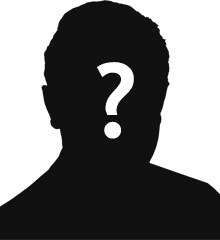 He was born in County Tyrone about 1897. The 1901 census records Thomas as 4 years old. The family is living at Annaloughan, Augher. Thomas senior is a farmer. The 1911 census records Thomas senior as having died about 1909. Thomas is no longer living with the family at Annaloughan, Augher. Private Thomas James Kernaghan (was serving with the 2nd Battalion of the Royal Inniskilling Fusiliers when he died 4th December 1915, aged 18.